Click on the question to display the answer below. Will it fit through my doorway? The cabinet base is separate from the tub itself, so the tub fits through a standard doorway (25″-36″) on its side. A Safety Plus or Basic tub is 25″ high on its side by 60″ long. The economy and Electronic Touch Control Systems are 24″ high by 60″ long. Maximum Water depth is 15″, which is deeper than most tubs. The overall height of the tub and cabinet base is 38″ to edge of the rim when installed. The lip of the door opening is 20″ from the floor. * We can raise or lower the cabinet base by special order to accommodate people of varying sizes. The cabinet base ships separately packed and is 16.5″ high x 60″ x 35.25″. A Safety Plus or Basic tub is 25″ wide, 60″ long on its side. The economy and Electronic Touch Control Systems are 24″ wide by 60″ long. They should easily fit though most doorways for installation. An assembled Aquassure bathtub has more hipspace inside than the largest of the walk-in bathtubs on the market. (The Big E by Best Bath). 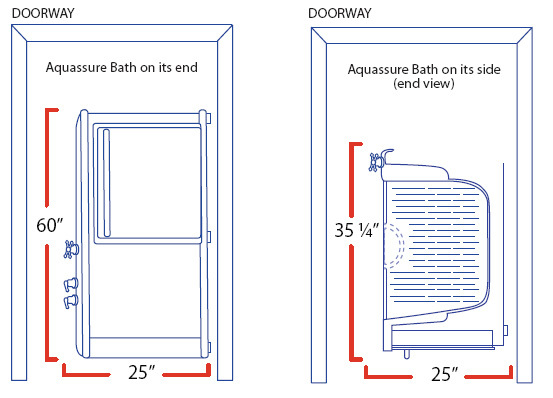 The outside width of the Aquassure tub, once installed is 35.25″. The inside shoulder width is 27″ wide. Our sliding doorway has a 24″ opening. The whole tub is 60″ long (5 feet). The tub accommodates approx. 35-40 gallons of water, so will not overflow your septic tank or require a new hot water tank. Where are the bathtubs made? The Aquassure ADL Spa bathtub is Canadian designed. Head office in Kelowna, BC, Canada. The tubs are being manufactured, under license, by Best Bath Systems in Boise, Idaho at their large manufacturing plant. Many of the parts on the ADL Spa, including the fixtures and the air jet hydrotherapy systems, are manufactured in Canada. Plumbing fixtures and other parts for the bathtubs are purchased from US, Canadian and European (Germany & Italy) suppliers. All showers, tub showers, and pans have a 30 year limited warranty on the gelcoat, the longest available on the market. The 3/8 inch plywood reinforced walls are not prone to flexing and cracking as found in other products on the market. BBS WARRANTY – 30 year limited lifetime warranty on the fiberglass only. Any manufacture’s defect (air void, gel coat peeling) will be covered for a long as the original purchaser owns the unit. Each accessory has its own manufacturer’s warranty – pump 3 years, water stopper 1 year, blower 1 year, fixtures 1 year. DOORS – there is a limited lifetime warranty on walk-in tub and slide-in tub doors. VIDEOS – there are videos on how to repair cracks, nicks and dings. REPLACEMENT – if you receive a part or a unit that you did not purchase, was not on your purchase order, or was an incorrect item, we will issue an RGA (Return Goods Authorization), pay for return freight, and will send replacement item(s) if necessary. RGA – 90 days to initiate a return of goods. After an RGA number is issued, BBS must receive the item within 60 days. There will be a 25% restocking fee and customer will pay for shipping the wrong item back to BBS or BBS can arrange freight which will be deducted from credit. Custom items cannot be returned. FREIGHT CLAIM – inspect the crate and inside crate within 5 days of receiving it. Any visible damage on crate must be noted on bill of lading. If there is a freight claim, BBS is only allowed 15 days to report it to the freight company. FREIGHT DAMAGE – do not refuse a shipment with freight damage ? make sure damage is noted on bill of lading. Report damage immediately to BBS and warranty department will arrange repair. REPAIR CLAIM – repair technicians are not affiliated nor trained by BBS – we outsource repairs to a local company. Any manufacture’s defect will be covered 100% by BBS. Installation issues, mishandling of unit, improper maintenance, or construction damage can be arranged by BBS but will not be covered under warranty. REPAIR REQUIREMENT – We require your purchase order, sales order, or invoice. Contact Aquassure for help with this. We will also need address, and contact name and number and we may require a picture(s). 48 HOURS – please give warranty department 48 hours to respond to your claim. If after 48 hours you haven’t heard anything from the warranty department or your sales rep, please follow up. The door locks automatically when it is slid shut and the handle must be lifted to slide the door open. As an added safety precaution, the seal puts pressure on the side of the tub when there is water in the tub. The more water there is in the bathtub, the harder it is to open the door. The pressure on the seal locks it in place. It is possible to force open the door with water in it, but unlikely that someone would do it accidentally. It would take over 50 lbs of force to overcome the pressure seal compared to 2 lbs of pressure to open the door when the tub is empty. Does it matter is my existing drain is on the left or right side? No, it does not matter where your drain is located under the tub. We use your existing drain lines. There are cutouts for the drain in the cabinet base so the drain can be hooked up anywhere under the tub. This simplifies installation and saves time and money. Does it matter if my water intake lines are on the left or right side? We use your existing intake lines. There are cutouts under the tub through the cabinet base supports to provide clearances to run hoses from the water intake lines. In the Safety Plus and Touch pad Systems, we provide 5′ flex hoses to hook the fixtures to your existing water lines at either end of the tub. This saves time and money during installation. If you purchase a tub without a cabinet base, you will have to make allowances for drain and water intake lines when building a platform for the tub. It should fit any standard bathtub enclosure. Aquassure tubs are a bit wider than a standard tub, so the width of current tub and location of toilet should be measured. The toilet can usually be moved over up to 4 inches to make fit using an offset flange. If your current bathtub is under 5-feet long, we may need to go into the drywall a bit at the sides or turn the studs on one side to make it fit. We offer a left or right hand door opening so in smaller bathrooms, the location of the toilet and sink often determines the door opening. Occasionally we cannot fit an Aquassure bathtub into your bathroom – for example when replacing a stand alone shower. The bathtub can be installed in a bedroom or spare room in this situation or we have a walk-in bathtub available for sale. We can send an installer/sales rep out to measure and give an opinion about installation cost and a written quote on installation, if you wish. Over 80% of bathtubs are 5-feet (60-inches) long. Aquassure tubs can be installed in most spaces 58-inches or longer. If you are wondering if the tub will fit through a doorway… YES IT WILL FIT! Aquassure tubs are shipped with the cabinet base flat packed inside the tub. The tub itself will fit through doorways as narrow as 24-inches when carried on its side. How does the door work? The door slides in a track. When the door is fully closed a pin drops down, automatically latching the door in place. To open, lift the door handle near the centre of the tub and slide the door open. This is easier from inside of the bathtub. For those who can’t reach over the side of the tub, there is an extender bar available. The door has an internal stainless steel frame with bronze pivots and Delron wheels. The aluminum track is hard anodized for durability. The top wheel is spring loaded so the entire door can be removed to reach the access panel behind (in case of installation or maintenance). During certification the door mechanisim and seal was tested for 20,000 cycles opening and closing, then filled with warm water, and did not leak. 20,000 cycles = 55 years of bathing every day. The seal is made of automotive grade urethane, not silicon or surgical tubing that can break down over time. The patented V-shaped seal works with the water pressure. The water pressure forces the seal against the side of the tub. More pressure=better seal. There is a lifetime warranty on the seal. Every Aquassure accessible bathtub is water tested for quality before it leaves the assembly plant.